1. In a bowl, combine sauce ingredients then stir until well blended. 1. In a wok, heat oil then saute garlic and chili. 2. 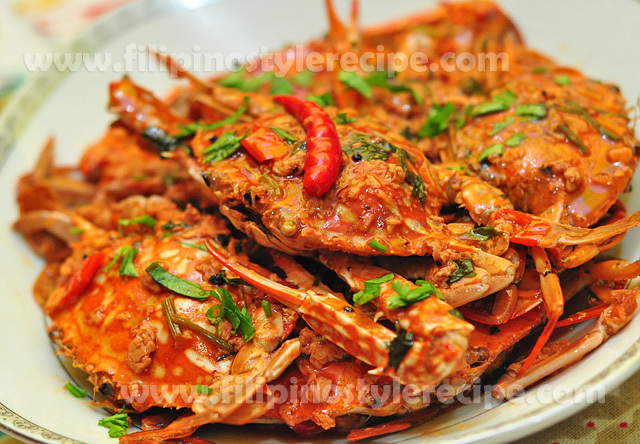 Add crabs then stir fry until shells color turns to red. 3. Add sauce then toss. Cover and simmer for 3 minutes. 4. Add beaten egg and stir. Squeeze lime juice then add seasoning according to taste. Simmer for another 2 minutes or until almost thickens. 5. Transfer into serving plate then sprinkle with chopped cilantro. 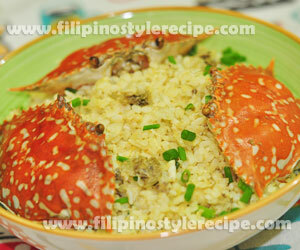 Filipino Style Recipe: Crab fried rice is another easy and simple delicious fried rice dish. It is mainly made up of fried rice and crab meat mixed together until cooked. 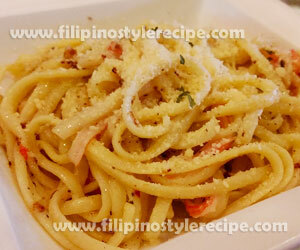 This dish is usually served during breakfast together with your favorite dish and soup. 1. In a pot, boil crabs in salted water over low heat for 10 minutes or until cook. 1. In the pan, heat oil and saute ginger, garlic and spring onion. 2. Add crab meat then stir cook for a minute over low heat. 3. Add cooked rice then seasoned with salt and ground pepper according to taste. 4. Keep stirring for 5 minutes then transfer to serving plate and garnish with spring onion. 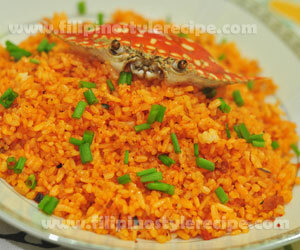 Filipino Style Recipe: aligue rice is another easy and simple but mouth-watering fried rice dish. 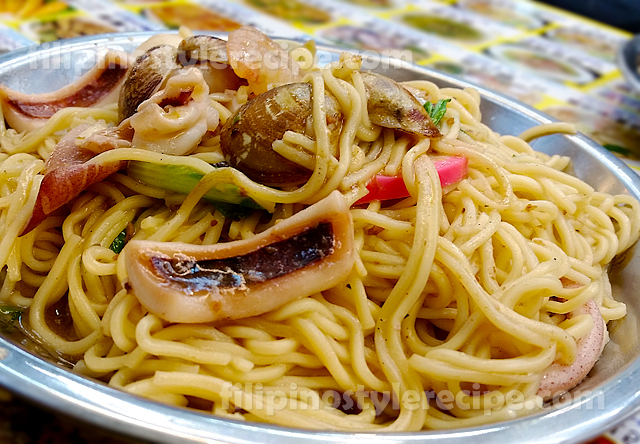 It is mainly made up of fried rice and crab fat mixed together until rice is well coated. Usually served during breakfast together with your favorite dish and soup. 1. In the same pan, heat olive oil and saute ginger, garlic and spring onion. 2. Add aligue then stir cook for a minute over low heat. 4. Keep stirring for 5 minutes or until until rice is well coated. 5. Transfer to serving plate and garnish with spring onion.